Clicking on the name of the site listed below will take you to their website. 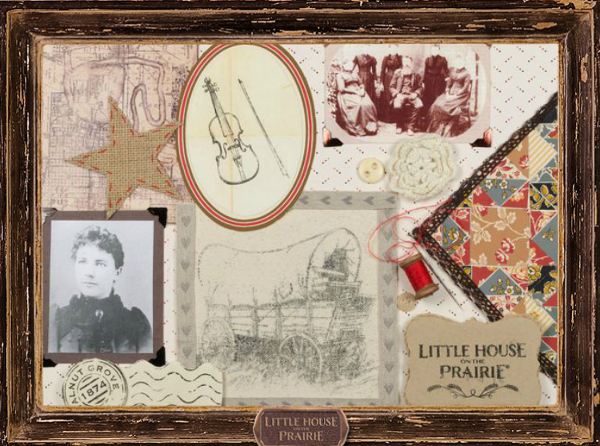 Whether you are a fan of the Little House books, or the tv show, or both, Little House on the Prairie.com is a website you need to check out. It is a wonderful resource of information on everything from Laura historic sites to the backstory behind various aspects of Laura's life to a lifestyle section that provides information on how you too can recreate a Little House experience. This summer, I had the pleasure of meeting some of the people behind the website, and I was invited to write an article or two for them. This link above will take you to the first article, Quilting with Laura Ingalls Wilder. Enjoy! Author Kathleen Ernst is one of Wisconsin's own. Not only has she written several young adult books as part of the American Girl doll series, but she also has several books for adults under her belt. Being a historian at heart, she has written a mystery series with Wisconsin ties. 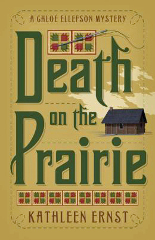 The newest in the series, Death on the Prairie, picks up on the adventures of her main character Chloe Ellefson, a Collections Curator at Old World Wisconsin. While Chloe is fictional, Old World Wisconsin really exists. It is an open air museum in Eagle, Wisconsin. In the story, Chloe has been given a quilt that was supposedly made by Laura Ingalls Wilder. In an effort to try to authenticate the claim, she and her sister take off on a road trip to several of the Laura Ingalls Wilder historic sites to see if they can match any fabrics from the quilt given to her to fabrics used in quilts known to have been made by Laura. And because it is a mystery, and because these things just keep happening to Chloe, dead bodies start turning up. Not only did I have the pleasure of being commissioned by Kathleen to make a quilt for her to help tell the story of Death On The Prairie (check out the Commission section of this website), but she also asked me to write a review for the book. Imagine my delight to see that my review appears on page one! I have really enjoyed the entire Chloe series, and I think you will too. If you haven't read these books yet, I highly recommend them for a fun read. 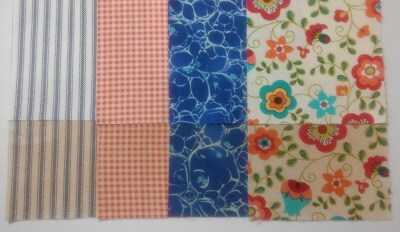 Watch for the release of my pattern for the quilt I made to go along with Death on the Prairie coming soon. Some of you may remember that in 2012 I had the honor of being one of the featured presenters at Laurapalooza, the conference held in Mankato, MN in which researchers presented papers on their area of research on Laura Ingalls Wilder. What fun that was. My presentation was about what quilting was like when Laura was learning to quilt. It resulted in the lecture program that is now one of my program offerings. The 3 day event was such a treat! Attendees included fans of the books as well as fans of the tv show. Presentations delved into the backstories of Laura's life. It was great fun. Well, it is Laurapalooza time again, and there is great excitement about this year's event. Laura began writing down her stories when she was in her 60's as a way to be sure that the stories weren't lost. Her autobiography, Pioneer Girl, was submitted to publishers, but no one was interested. Not being one to give up easily, she reworked it into a much smaller book called Little House in the Big Woods. To our great fortune, that was picked up by a publisher, to great success. Readers were so enchanted that they wanted more, and eventually, the series of books that are now loved worldwide came into being. That still left her original autobiography unpublished. After many years of research, editor Pamela Smith Hill teamed up with the South Dakota State Historical Society to publish Laura's book as an annotated autobiography. Ms. Hill does an amazing job of placing the text in historical context, complete with photos of the people and places Laura wrote about as well as the backstories to Laura's writings. They went to press last Fall with 15,000 books which were snapped up by Laura fans before they had even come off the press. So a second printing of 15,000 was ordered, and that didn't begin to cover the pre-orders that were coming in. Reviews began showing up in the likes of the New York Times, the Wall Street Journal, and on NPR, to name a few. To make a long story short, by midsummer, 145,000 copies will be in print, and readers who ordered their copies months ago are finally getting their copies. The 2015 Laurapalooza Conference was held in Brookings, SD, and Pamela Smith Hill was the keynote speaker. Here is a link with information about the Conference. Tentative plans for the next conference in 2017 place it in the Mansfield, MO area, where Laura made her home for most of her adult life. This coincides with the 150th anniversary of her birth. Hope to see some of you there! For info about the upcoming conference, as well as other things related to Laura Ingalls Wilder, check out the link below. One of the joys of teaching is the people I meet and getting to know a little about them. The last several years, Hope has been coming to my retreat in upstate NY. Turns out her son has a most interesting business. He creates custom made sewing accessories out of beautiful wood as well as colorful acrylics. I became interested as soon as I saw her seam ripper, but when she mentioned that he is currently working with lilac wood, I was hooked. When we lived in NY, our property had over 90 varieties of lilac trees on it, so lilacs have always had a special place in my heart, but when I went to his etsy shop and saw some of the other woods he also uses, I knew I had to share his site with you. Ethan Cook, of Cook Crafted, turns wood as well as acrylic on a lathe to create tools that just plain feel good in your hand. Ripping can be a chore, but with his seam rippers, it becomes a meditative experience. The one I ordered has a seam ripper at one end and a stiletto at the other. Both tools pull out of the handle so they can be reinserted point in into the handle for travel and storage. 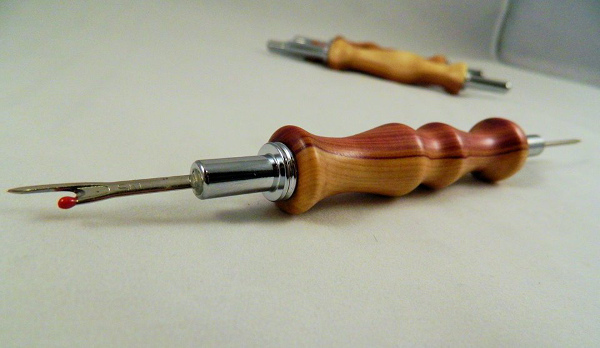 Hard to believe one could get excited about a seam ripper, but trust me, when you see these, you will want one. The hard part will be choosing one. He has a variety of styles available. If you are looking for a special gift, these would fill the bill nicely. Check out his Facebook page also to see the step by step process he uses. I know you too will be intrigued. I had the pleasure of being the guest on WRCO Radio's Morning Show the other day. I first met Ron Fruit, host of the show, through his wife Beth. Beth, a quilter, has having so much fun quilting that Ron decided to join in, which made the interview particularly fun. Here was a host who really knew what he was talking about and who shares a love of quilting! It was a fun morning. Click on the link above to listen in. For those of you who travel throughout southwest Wisconsin, there is a lovely quilt shop in Fennimore (12 miles down the road from me). Spacious and with several well lit rooms, they feature quilting fabric, notions, yarn, class offerings, long arm quilting services, and retreats. If you are a lover of antique sewing machines, they have an excellent collection of featherweight machines available. They are located on U.S. Hwy 18 just down the road from from Southwest Technical College. Their lower level is a huge (and I mean HUGE) classroom, complete with restrooms and kitchen facilities. You can access this level from the back of the building so that no stairs are involved. They could easily accommodate 30 people, each with their own large table. There are several flannel boards mounted around the room. This is a terrific workspace with excellent lighting and ample electrical outlets. Be sure to check it out! 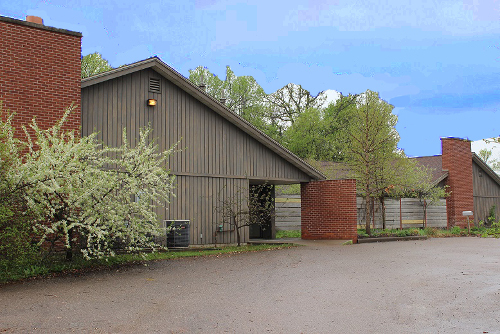 Chris describes it best: Woodland Ridge Retreat is a creative getaway designed with quilters and fiber artists in mind. Located in the rural village of Downsville, Wisconsin, this idyllic property overlooks the scenic Red Cedar River Valley in the west-central part of the state. Our retreat offers deluxe accommodations and brightly lit gathering rooms. The facility is on one level with ADA accessible guest accommodations. I have to say, just looking at the pictures is an inspiration. The setting is so peaceful, the light in the rooms is amazing. I can't wait to check it out. You should, too. You'll be glad you did! While teaching at one of my retreats, I came across this product I just had to share with you. I listed it as my February 2013 tip, but in case you don't read that section of my website (and if you don't, you don't know what you are missing! ), I wanted to list it in the Links section. It is called Walnut Ink Antiquing Spray, and it is pretty amazing stuff. If you have fabric that is too white, too bright, or too new looking, spritz it with Walnut Ink Antiquing Spray, heat-set it with an iron, and it takes on a lovely mellowness that transforms it! Here is a before and after setup, with the top row being the original fabric, and the bottom row being the antiqued fabric. Several students used it in the workshop, transforming fabric that was too bright for their collection, creating fabrics that really worked! Made by Cindy Hilfiger, it is all natural, acid free, and can also be used to antique leather, paper, wood, anything that is porous enough to absorb the spray. The Walnut Ink Antiquing Spray is available on Cindy's Etsy site. If you are new to Etsy, it is a website where artisans can set up their own online shops to sell handcrafted items. I have found some wonderful treasures on Etsy, and it is a great way to support the the crafting community. While at Cindy's site, check out some of the other items she has to offer. And be sure to try the Walnut Ink Antiquing Spray. Cindy provides some very good information about how to use it on her site. The importance of having good tools can't be underestimated. When was the last time you updated your scissors? I treated myself to top of the line scissors 30 years ago (can it really be that long??) 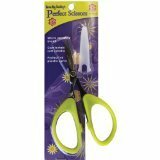 and I have taken good care of them, but I have to admit, when I tried Karen Kay Buckley's scissors last year, I was blown away at how much scissor technology had changed. Karen is a well known award winning quilt artist. You have seen her quilts many times on the cover of Quilters Newsletter Magazine. She is known for her astonishing applique quilts. If anyone knows the importance of having good tools, it is Karen. That is why she worked with scissor manufacturers to come up with her ideal tool. 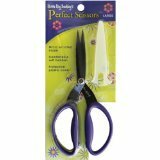 and large (purple handles), perfect for larger cutting jobs. These make the perfect gift. My husband is into fly fishing, and ties his own flies. I got him the green ones, and he loves them. The finger holes are large enough for his hands, and they allow him the control he needs for cutting tiny snippets of fur and feathers for the flies he ties. I got my mom both pairs. She has arthritis and has trouble with most brands of scissors because they are uncomfortable for her to grip and cut with. Not these. She loves these. Karen is not paying me to tell you how great these are. I am just a huge fan! Gatherings, the shop here in Boscobel, has started carrying them. Be sure to stop in and treat yourself to some really fine scissors! I had the honor of being a guest on Sarah Uthoff's Internet Radio show Trundlebed Tales, talking about quilts and what quiltmaking was like during the times of Laura Ingalls Wilder, author of the Little House on the Prairie books. Sarah and I met back in 2012 when I was a featured speaker at Laurapalooza, a conference devoted to the life and times of Laura Ingalls Wilder. The Little House books, made even more popular by the Little House on the Prairie television series, tell of the life of Laura Ingalls Wilder as she grew up in the Midwest during a time of pioneering expansion. Quilting was a big part of Laura's life. In fact, she mentions quilts and quilting over 70 times in her books. And that is what I was there to talk about. Doing the presentation at Laurapalooza was great fun. I could show quilts to illustrate my talk. The radio interview was a totally new presentation experience for me! I had to rely totally on words to express myself, with no props or pictures! I have to say, it was great fun. You can listen to the broadcast on your computer. Just click on the link above and it will take you to the site. The show is one hour long, and we really covered a lot of territory! Imagine my delight to have heard from Sarah that over 2,000 people have listened to the broadcast and it has been one of her most listened to broadcasts! The internet is a great tool for learning as well as research. Listed below are several sites I thought you would be interested in. Enjoy!